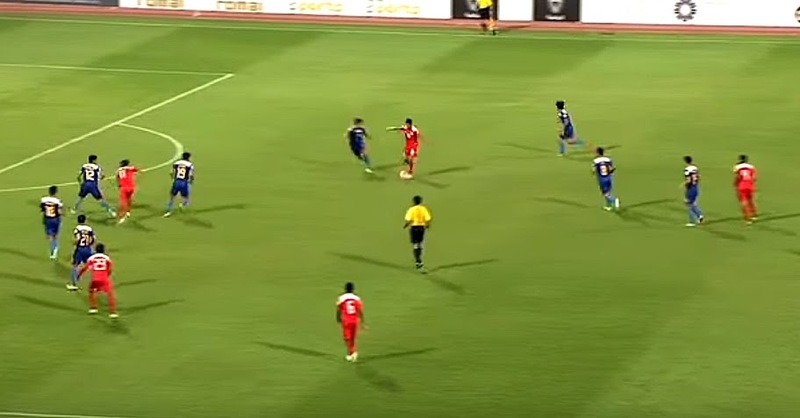 Image captured from video on The AFC Cup channel on YouTube. Ultimately, what last night’s chastening 1-nil loss by the Philippine Azkals at home to bottom-of-the-table Yemen does is to reiterate the very essence of football and of any sport, for that matter. That is, that if you do not take your chances, you do not win. Yemen did, a deflating 83rd minute goal by substitute Ahmed Al Sarori against the run of play as the Philippines pushed forward in numbers. The same player could have scored earlier in a similar break after an uncharacteristic mistake by the otherwise excellent Daisuke Sato. To be fair, Yemen scrapped and snapped into tackles, abetted no doubt by Korean referee Kim Hee Gon’s liberal officiating. Yemen’s tough tackling, likely borrowed from Bahrain’s no-nonsense approach at the National Stadium in Riffa last month, ensured that the Azkals could not replicate the same crisp passing that we saw in Doha last June. The Azkals still enjoyed the lion’s share of possession, but were significantly lacking sharpness in the final third particularly in the first half. The Yemenis also rode their luck, often with some desperate front of goal defending. Twice in the second half, they kept the Philippines out with goal-line clearances. The first was a point-blank 55th minute header by Jerry Lucena from Manny Ott’s freekick. The second was even closer when the ball was literally cleared from off the line in the 67th minute after a break involving substitute Misagh Bahadoran. Bahadoran’s arrival in the 66th minute immediately gave the Philippines the pace and urgency that were lacking in the first half. There was some logic in injecting that pace against a tiring defence late in the game. On the other hand, perhaps he could also have come in sooner since there just appeared to be little or no chemistry between Patrick Reichelt and Javier Patiño at all. Both are penalty box specialists who thrive when their team enjoys controlled possession. Neither is really known for the verve, speed and running that was needed probably as early as the first half. The Philippines also had two reasonable shouts for penalties waved away. The first was from a 73rd minute hand-ball inside the box from a Kevin Ingreso cross. The second was even clearer, an 88th minute shove on Stephen Schröck that will be a penalty any day in the English Premiership or the Bündesliga. Do whisper it quietly, but the Philippines did miss the physical presence and skill of a certain Philip Younghusband. Schröck improved on his tepid first half performance after the break, but still looked lightweight and easily pushed off the ball in the middle of the park. What the result means, coupled with the Uzbeks’ 3-1 home win over DPR Korea, is that barring a major miracle of the calibre of Moses parting the Red Sea, the dream of Russia is likely over. Not that, realistically, the odds were ever in favour of our going through. As it happens, the loudest cheers last night after the final whistle blew were likely in Manama. Yemen’s first win in the qualifying group also opened the door for Bahrain to pip the Azkals to the third spot and an automatic place in the third round of Asian Cup qualifying. There is some comfort in that Bahrain are at Pyongyang on Tuesday; but they also have Yemen at home in March before travelling to Tashkent for their final group match. The Azkals, meanwhile, face a lengthy trip to the former Soviet Republic before returning home for its final group match against DPR Korea. Everything is, naturally, still to play for; particularly in trying to ensure that we hold on to the third spot and the automatic Asian Cup third round automatic qualifying slot. Whichever way this campaign ends, however, it still has to be looked upon as an unqualified success. In retrospect, perhaps it could have served us better had the Azkals’ campaign started slowly and then built up steam as the campaign went along. Instead, opening the campaign with big guns blazing and two quick and arguably unexpected results also brought unrealistic expectations. Yet, although performances have tapered down from those lofty heights in June, along the way the Azkals still picked up two victories over Middle Eastern teams they had not erstwhile beaten and a defiant draw in the cauldron that was the Kim Il-Sing Stadium in Pyongyang. The knowledge alone that we have a team that is capable of this is priceless, particularly for future tournaments. We now know that we have taken a step up from Southeast Asian football. We can now take the pitch against the continent’s more renowned team and know that not only will we not be blown away but are actually capable of getting results. All that is needed is for the team to play at the desired level in every match, something that will come with experience. The truth is, the likes of Korea Republic, Japan, Iran and Australia did not rise as meteorically in Asian football as the Azkals have. Thus, patience is also needed despite last night’s chastening loss to Yemen. Final matches against the two group leaders may appear, on paper, like veritable mountains to climb. This is when the Azkals need to call on the knowledge gained throughout the campaign despite the blip against Yemen. The team needs to believe that it can stand up to both Uzbekistan and DPR Korea. More importantly, each player needs to stand up and be counted.